In recognition of Minority Health Month (April), Health Equity staff made informational baskets for the “Beauty Salon Project”. Twelve randomly selected beauty salons in the African-American and Latino community were given baskets full of apples, health and wellness flyers and information about health department services. This was another way to educate the community and enhance LFCHD’s working relationship. The Lexington-Fayette County Health Department honored Administrative Professionals Day on April 25. Starting May 1, the Lexington-Fayette County Health Department’s vending machines will move toward featuring more healthy selections. Staff met with our vending machine retailer, and then selected offerings based on overall calories, fat, sugar and sodium content, as well as products that would still be affordable for the population we serve. Vickie Blevins and Jay McChord were presented with the 2012 Public Health Heroes Awards during the April 9 Board of Health meeting, and at the April 12 Lexington-Fayette Urban County Council meeting. Click here to read a Herald-Leader feature about Blevins and McChord. 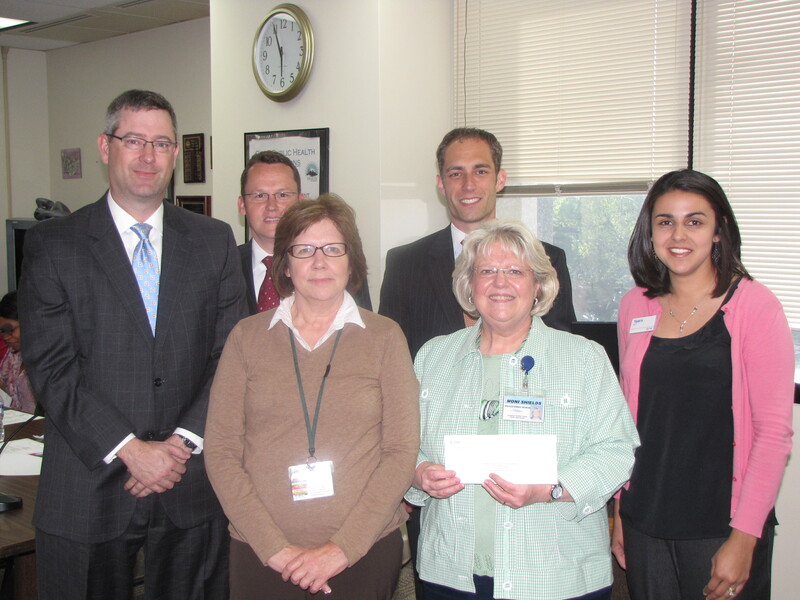 The HANDS program was presented with a grant in the amount of $5,000 from the PNC Foundation, of the PNC Financial Services Group, at the April 9 Board of Health meeting. This grant was awarded as part of PNC’s “Grow Up Great” program, which is committed to early education. The program shares the HANDS mission of supporting families as they build healthy, safe environments for the best possible growth and development of children while preparing them for school and life. The grant money will be used to purchase educational/developmental toys and craft supplies to be used in curriculum activities to further engage parents and children during home visits. 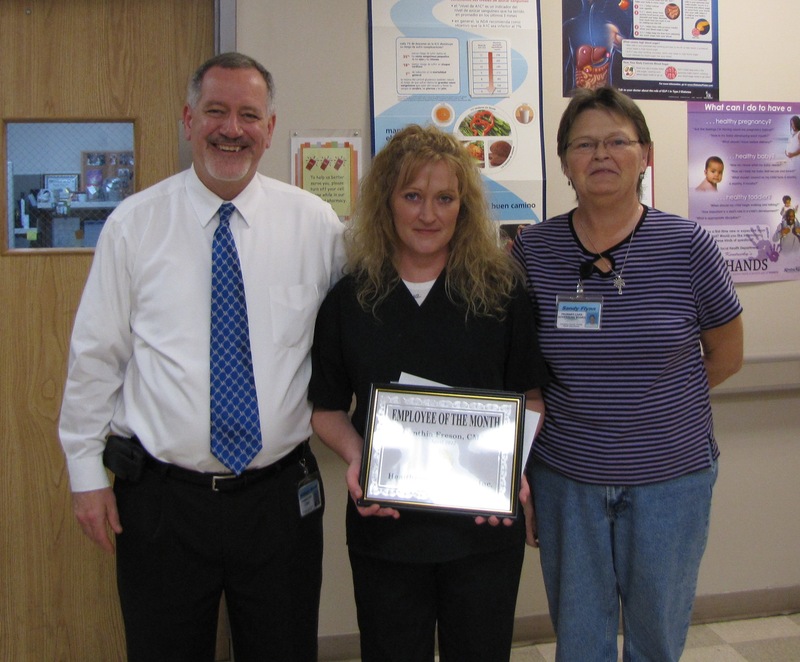 Cindy Freson was presented with the HealthFirst Bluegrass Employee of the Month Award from William North and Sandy Flynn, HFBG Board of Directors Member. 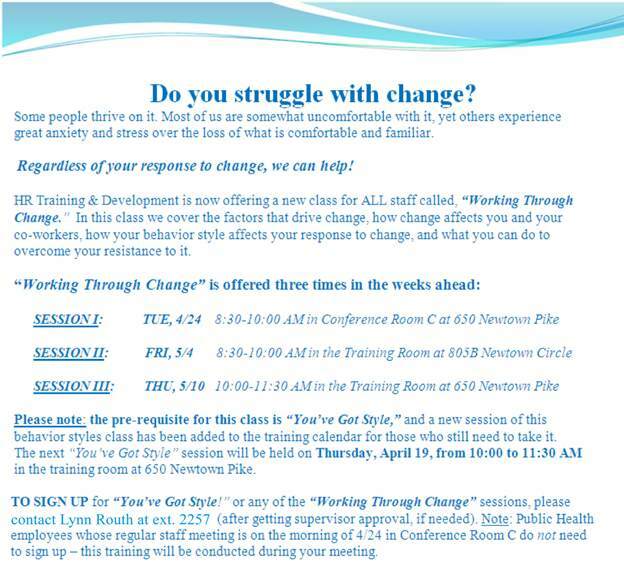 The Human Resources Training and Development program still has available spots in three sessions of a new class, “Working through Change.” This class covers the factors that drive change, how change affects you and your co-workers, how your behavior style affects your response to change and what you can do to overcome your resistance to it. Click here to learn more about the class and find out how to sign up.